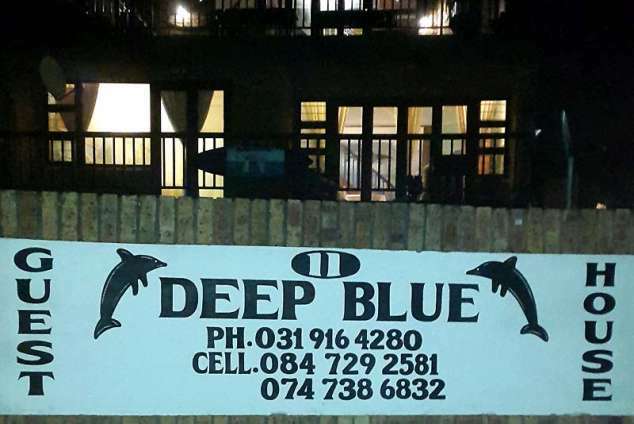 Deep Blue Guesthouse and Lodge - Warner Beach Accommodation. 7/16 - Coral Reef Room, one double bed and two single beds. Deep Blue Guesthouse is nestled in a quiet cul-de-sac right on the beach front, catering for corporate and holiday guests. Sea facing rooms and decks enjoy 180deg seaviews and guests are able to soak up panoramic views of the Indian Ocean and all the magic it has to offer. Safe off street parking. Situated 40min from King Shaka International Airport, 30min from Durban centre and 5min from major supermarkets, restaurants and shops. It is an easy walk along the beach for the guests to wallow in the cool of the magnificent ocean at a protected beach or rock swimming pool with life guards. The Guesthouse is within close vicinity of Prospecton, Heartland and Southgate Industrial Parks. Guests are able to enjoy, fishing, surfing/bodyboarding, kite surfing, snorkeling and long walks. Many other sporting activities on offer include golf, tennis, bowls, squash and bird watching. Dolphins and whales frolicking in the sea can be viewed whilst relaxing on the deck. The area also offers, within an easy drive, Game Reserves, Midlands Meander, Valley of a Thousand Hills, Deep sea fishing and Casino's. African Dream (Honeymoon Suite) - 2 double beds, en suite, 180deg seaview, ceiling fan, TV, coffee/tea station, mini fridge & hairdryer. Dolphin - 1 double bed, en suite, seaview, sliding door opens onto deck, ceiling fan, TV, coffee/tea station, mini fridge & hairdryer. Marlin - 1 double bed, own toilet/basin, sharing shower, ceiling fan. Garick - 2 single beds, sharing ablutions, ceiling fan. Kingfish - 1 double bed, sharing ablutions. Coral Reef (Family Room) - 1 double bed, 2 single beds, en suite, coffee/tea station, mini fridge & hairdryer, own outside area. Lounge/Entertainment area - TV with DStv, pool table, built in braai on deck with 180deg seaview. 24078 page views since 08 Sep, 2008.